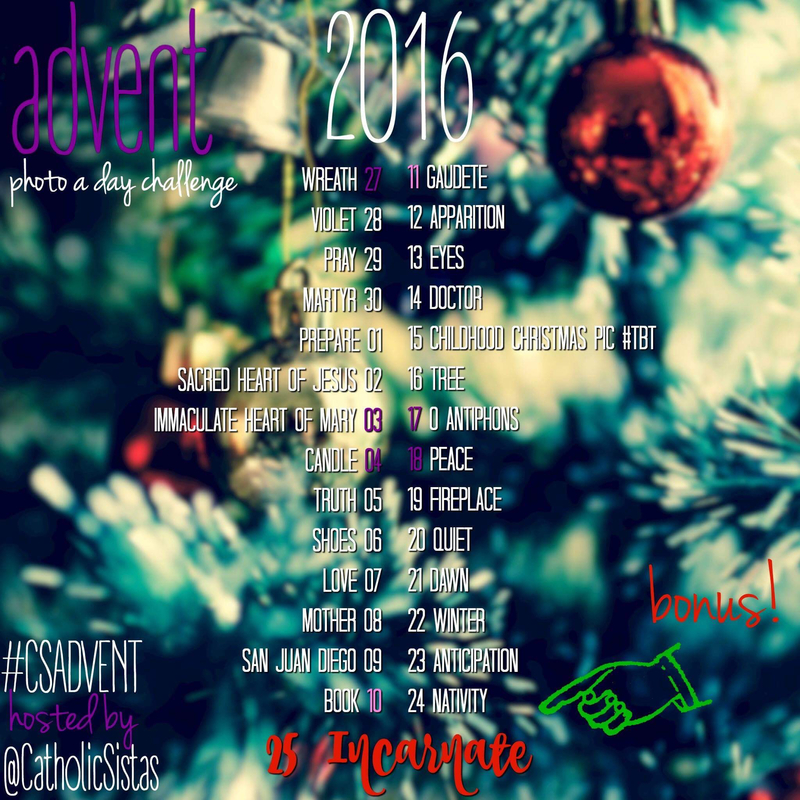 Not my idea, but I wish I’d thought of it: I’m going to join the Catholic Sistas for their 2016 Advent photo challenge. The more, the merrier. Anything on social media during Advent that’s about or inspired by Advent is a good thing. • Each day has a word associated with it. Snap a photo or find an old photo related to that word. The photo does not have to be faith-themed, as the goal of our photo challenges is for us to see God in our everyday lives. • While our main platforms for the 2016 Advent Photo Challenge are Instagram, Facebook and Twitter, we are present on many other platforms. Tag us with @CatholicSistas on INSTAGRAM, PINTEREST and FACEBOOK, @Catholic_Sistas on TWITTER and +CatholicSistas on GOOGLE+. And if you’re blogging about your Advent Photo Challenge, link back to us or comment below with a link to your post. • Download the 2016 CSADVENT GRAPHIC for quick reference. Note that the dates of the weekends are a different color to help visually break up the days. Be sure to share the graphic with others and invite them to join the challenge too! Low-key, fun, no craftmaking skills required: I’m in. This entry was posted in Faith and tagged Advent, Catholic Sistas. Bookmark the permalink.